There’s just something about acoustic versions of songs that work- when done right, at least. If you’re anything like me, you love a good acoustic song. It just feels right. It reminds you of sitting around a bonfire in the middle of Fall and it feels good. 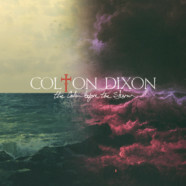 Colton Dixon’s latest release-The Calm Before The Storm is the perfect encapsulation of that feeling. Featuring acoustic versions of some of Dixon’s biggest songs from his first two records, they may be softer but they’re also more powerful at the same time. The album title really is fitting too. It may be somewhat taboo to mention his name now, but Ray Boltz’ classic “The Anchor Holds” had a certain aura to it. It really was like sitting on a boat in the middle of the ocean during the storm of the century- yet you’re calm because you know God has it under control. The Calm Before the Storm has the same feel. You know the storm is coming but you know its okay. This may be one of Dixon’s most beautifully artistic pieces of work yet. If you liked the original recordings of “Limitless” or “Never Gone,” you’ll absolutely love the acoustic recordings. This is Colton Dixon at his best and it’s just tiding us over until his next full-length releases.